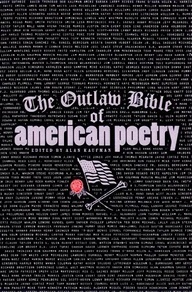 The Outlaw Bible of American Poetry, edited by Alan Kaufman, is an anthology of American underground poets spanning the post-war era to the present day. First published in 1999, the collection features work from several notable poets, including Jack Micheline, Patti Smith, Harold Norse, David Trinidad, Tuli Kupferberg, D.A. Levy, Bob Kaufman, Jim Brodey, Daniel Higgs, Jack Kerouac, David Lerner, Richard Brautigan, Allen Ginsberg, Tom Waits, William S. Burroughs, Ken Kesey, and Diane DiPrima, among others. S.A. Griffin served as a contributing editor. -anti-Vietnam war activists known for their anti-war rhymes (many poets write about Vietnam who are by no means outlaw poets). I haven't had a car in a decade now, but the last time I had a car I left my copy of The Outlaw Bible of American Poetry in there with Viktor Frankl's Man's Search For Meaning and it rained and both books got mildewed. Recently I published one of the founders of The Outlaw poetry movement, Tony Moffeit at Zombie Logic Review. I read with the other founder, Todd Moore, on many occasions here in Rockford and nearby. I wasn't in the Outlaw Bible of American Poetry, but I'm not an Outlaw poet. Or an Outlaw. It's a really good and comprehensive poetry that spans a lot of different eras and movements, including Beat, punk, and a lot of the small press revolution. Moore is included in the anthology, but Moffeit isn't. An oversight in my opinion, but still an indispensable part of any serious poet's library.